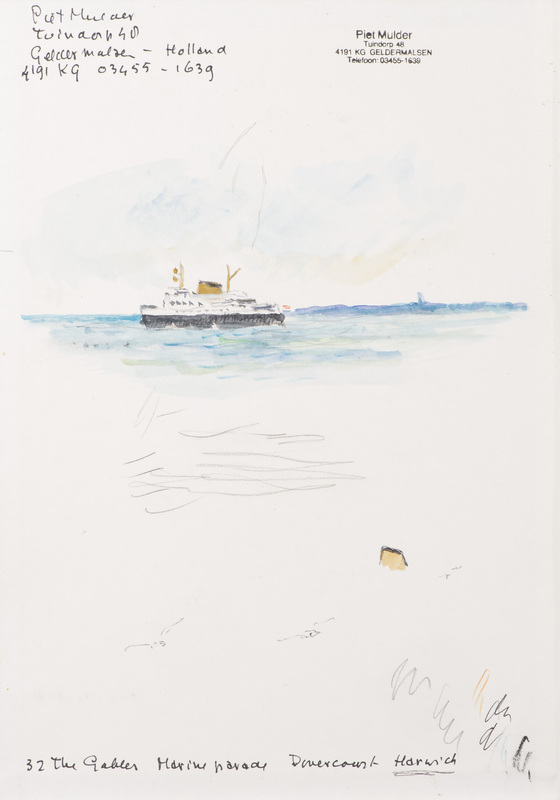 ‘The best watercolors include (…) Piet Mulder’s Low Tide in Harwich, with scruffy small boats, seemingly floating on mud…’ – William Zimmer in the New York Times about the exhibition of Dutch Marine Painting in the Mystic Maritime Gallery. 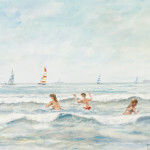 In 1975, for my father, the Dutch painter Piet Mulder (1919-2001), a new life began. Having had his studio in the heart of the Netherlands for 30 years, he now bought a second studio in Dovercourt, on the east coast of England, with a view of the sea that stretched for miles. England was not new to him. Following the liberation of the Netherlands in May 1945, Piet Mulder had emerged emaciated from his hiding place to be immediately taken on as a structural steel design engineer working for the British Royal Engineers who remained behind in the Netherlands. It was their job to repair the important north-south rail connections. The Dutch railway network had been largely destroyed during the war. Of the 21 major railway bridges there had been in 1940, only six were still safe for trains by 1945. At 26, Piet Mulder’s secondment to the Royal Engineers was a double liberation. Not only was he delivered from German occupation, he had something to do too, among a team of reserved Englishmen who turned out to have quite different customs than the harsh Germans. Since those days in May 1945, Piet Mulder had looked on England as the better country, where the landscape had not been contaminated by the great evil. Every time he arrived in England by boat, it was as if he was shaking something off, he told his children, because this was a place ‘they’ had never penetrated: the Germans. 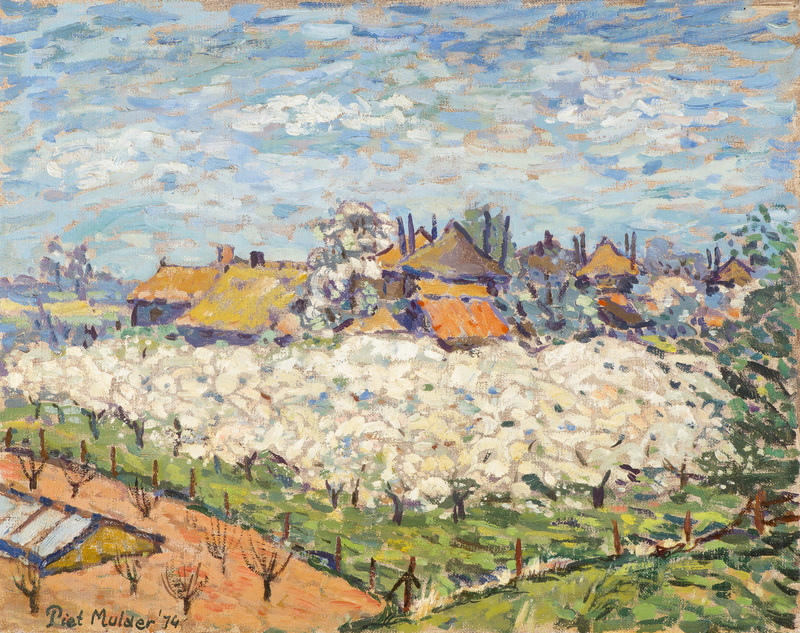 In contrast to the painter Armando, who kept looking for the ‘guilt-ridden landscape’ of his youth in the Netherlands and Germany after the war, Piet Mulder sought to retrieve his innocence in England. In that sense, Piet Mulder’s decision to take the plunge and go to England in 1975 was only a matter of time. He now moved into a new flat with all mod cons on Marine Parade in Dovercourt, with a wide view of the old naval docks at Harwich. The flat was the complete opposite to his old Dutch studio. It was situated high above the sea, on the cliffs, right next to the Cliff Hotel. From early in the morning it was bathed in sunlight and the view from the large sliding glass doors that stretched the whole breadth of the building was of constantly changing cloudscapes and enormous ships sailing by. On Saturdays and Sundays, these ships were joined by many lively old and new sailing vessels, in all shapes and sizes, criss-crossing the wide mouth of the Stour. The painter in Piet Mulder couldn’t get enough of it. From then on, he crossed the North Sea several times a year from Hook of Holland to Harwich, to record the English coastal landscape: the beaches at Wrabness with their strange stilt houses, Constable country around Dedham, the rugged tidal landscape out towards Walton on the Naze, the lightships off the quay at Shotley, the old fish sheds near Felixstowe Ferry and, of course, lots of houses in old Harwich. Was it a coincidence that here, right in front of his studio, was where one of the largest British naval bases had been established during the Second World War? 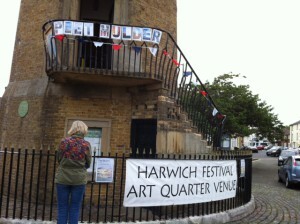 From his flat Mulder could see the rude remains of an observation post and dismantled anti-aircraft guns. 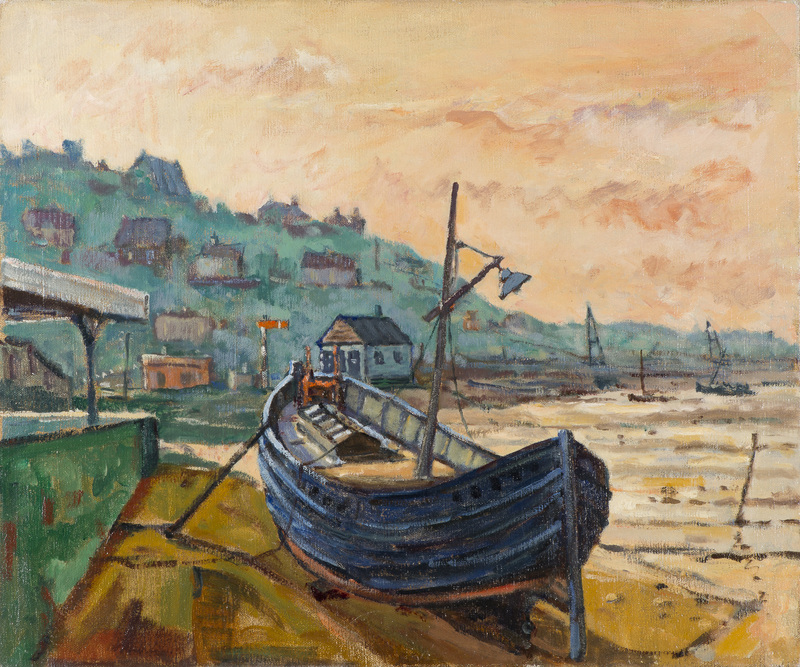 After some years, he also undertook more journeys inland from Harwich, to coastal towns like Hastings, Great Yarmouth, Lowestoft and the picturesque Pinn Mill. 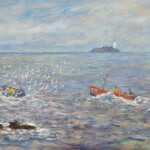 Later on he even took longer trips westward, to Penzance, on the shores of the ocean, and from there to the ports of Newlyn, the pretty old village Mousehole and of course St. Ives. 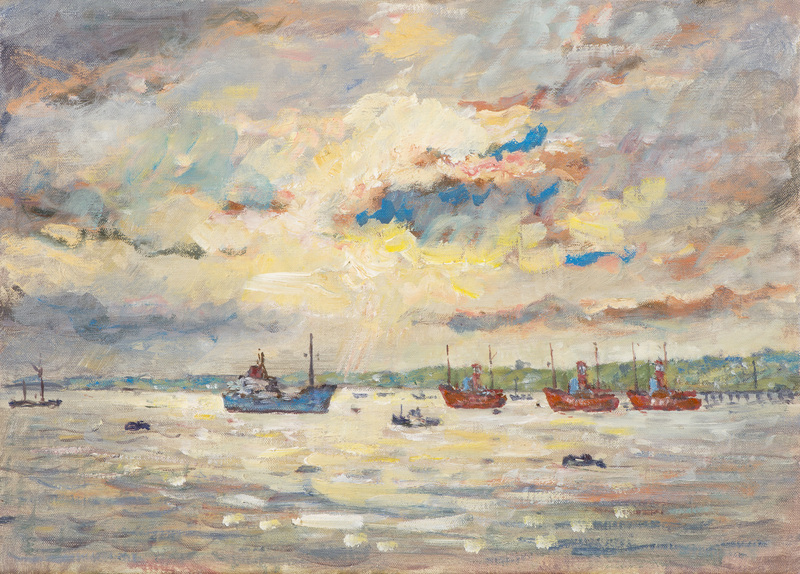 As long as there were quays to be found where fishing boats, sailing vessels or cargo ships sailed in, he was happy, as just the sea or large beaches were not enough for Piet Mulder. ‘The sea is a bore,’ he often said, with a sense of understatement. For him, there always had to be human activity to be seen at or beside the sea. And he found that activity everywhere where the land meets the water, in the villages and small towns where people who made their living from fishing and trade settled. The year 1975 would also mark a turning point in Piet Mulder’s painting itself. 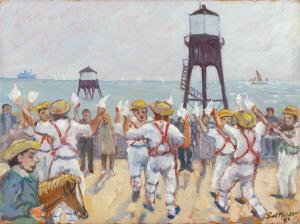 Up to then his work had had a continental focus, with influences of the Dutch artists Breitner and Israëls and French painters such as Matisse, Bonnard and Degas. From then, however, he developed more affinity with British painters like John Constable, J.M.W. 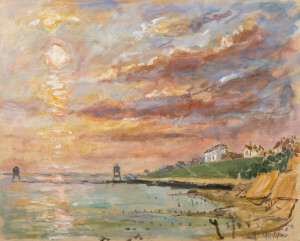 Turner, Augustus John, Philip Wilson Steer and the artists of the Newlyn School. Contemporary English artists, such as David Hockney and Lucian Freud also exerted considerable influence on him. Inspired by them, Piet Mulder began experimenting with coloured crayons and photo collages in the 1990s. ability to be recognised. He was convinced that the best painters were those who were simultaneously naturalistic and abstract. The use of fine colours, brush strokes and a good composition were essential to him, but the image itself also had to reveal something of the emotion he felt. That aspect of recognition was quite a taboo in the 1970s and 1980s in the Netherlands, whereas modern realists like Lucian Freud and David Hockney were celebrating their triumphs in England. He also liked the fact that water colours still carried plenty of prestige in England. 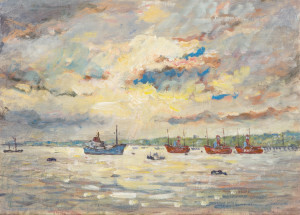 After he died, his estate included various English water colours he bought from local art and antique shops, which must have inspired him creating his own water colours. It was interesting to see how, after 1975, Piet Mulder’s use of colour expanded and shifted closer and closer towards the English style. 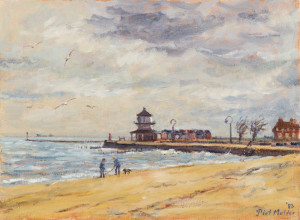 Previously his landscapes had been rather gloomy, with prolific use of ochres and greys, and he only used a lighter palette when painting snow or blossom. 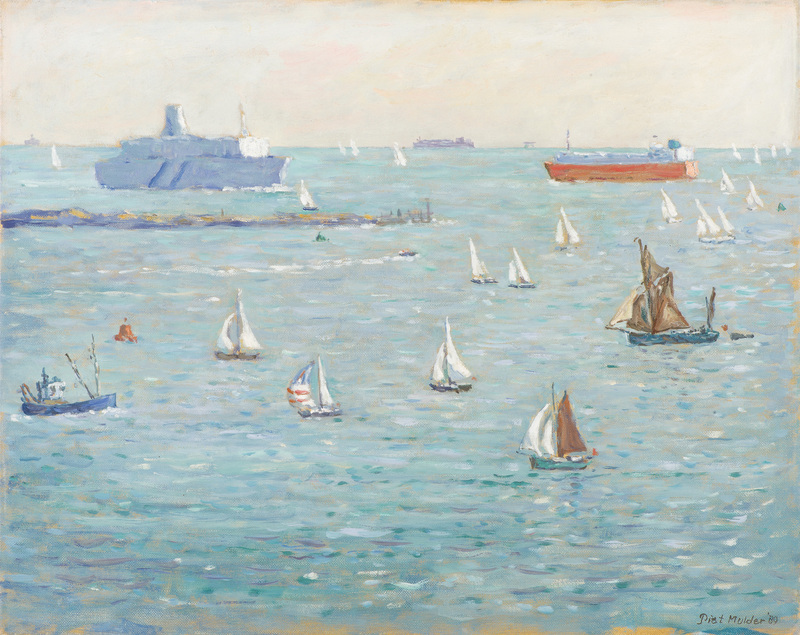 Once he was in England, however, he learned to use all the many shades of red he mixed on his palette, to paint his large cargo vessels and the Harwich light ships, as well as the many blues and greens he used to construct his seas. It is remarkable that precisely in this later, English period Piet Mulder discovered a place in the Netherlands where he began to feel utterly at home. A place that so closely resembled the English coastal landscape. It was the high section of embankment that winds its way round a couple of blind arms of the River Waal, five kilometres south of Geldermalsen. 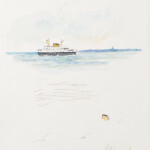 Here, between the villages of Haaften and Heesselt, he found a second spot in the final years of his life where, just as in his studio in England, he could look out over the choppy, shifting water for miles from a high point, while right in front of him, one giant vessel after another glided past. 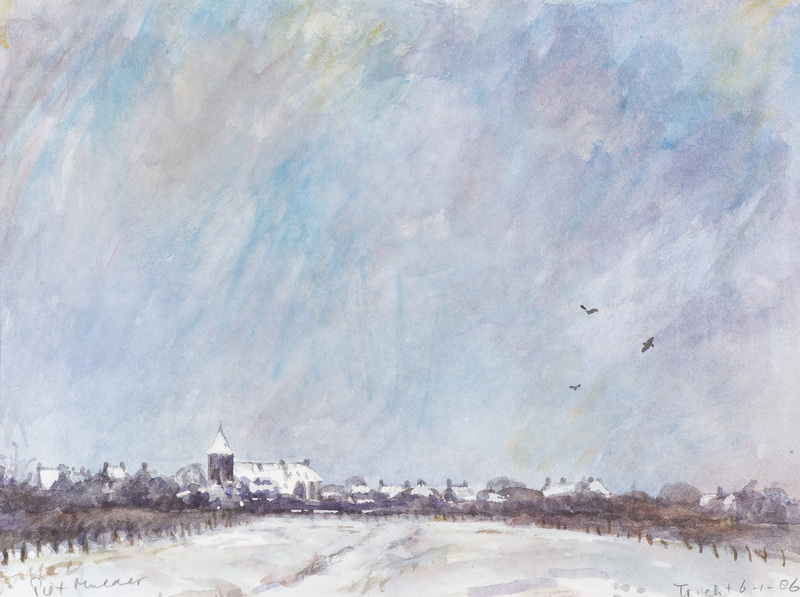 In his final years in the Netherlands, hardly a week went by without Piet Mulder and his wife Hanna, my mother, cycling to Waardenburg, Opijnen and Neerijnen to gaze over the River Waal and let my father sketch. To the right, he saw the repaired railway bridges over the River Waal, with the squat tower of Zaltbommel behind it; to the left the broad river along which the heavily laden barges and push tugs ploughed forward. And when he looked back, he would see the old castles of Waardenburg and Neerijnen peeping through the woods and the orchards. Everything that had occupied him in his life as a painter came together in this spot: the countryside, technical achievements, the Netherlands’ turbulent history and, above all, men and water. 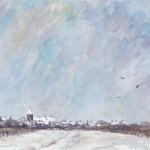 Piet Mulder,Winter in Tricht, watercolor on paper, 1986. 1919 Jacobus Petrus (Piet) Mulder was born on the 1st of november in St. Jansteen, in a house on the south-western border of the Netherlands. 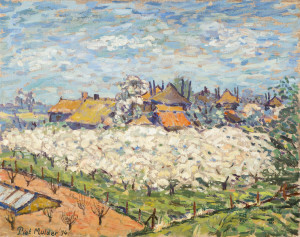 His father Antoni Mulder (1890-1963) worked as a custom officer and his back garden was in Belgium. In 1914, at the beginning of the Great War, his father was sent from his hometown near Deventer to this frontier as a young army officer, but in 1918, when the last Germans left Belgium, his father was demobilized, got his wife over and got a civilian job at the local customs. 1920-1932 The Mulder family often moved, as customs seldom stay long in one place. They had three children and lived in Roosendaal, Tiel, Rotterdam, Winterswijk, and finally Amsterdam, where Piet visited the 5 year-grammar school (HBS) on the Nassaukade and a school for engineers (MTS). He loved drawing, but his father wanted him to learn a solid job, where he could also use his excellent drawing skills. 1940 The Netherlands were occupied by the Germans, and Piet became editor and illustrator of Amoeba, the monthly of the Young Dutch Biologists League (NJN), till this magazine was stopped by the German authorities. 1941 Piet became railway engineer at the head office of the Dutch Railways (NS) in Utrecht, to save him from being sent to Germany, and moved to Utrecht. 1941-1950 In the evening he attended classes at the Art Academy ‘Artibus’ in Utrecht. 1944-1945 Piet was hiding in Amsterdam during the Great Railway Strike, a strike to help the allied forces in their way to the Dutch north. 1945 The Netherlands were liberated and Piet married Hanna Hulscher (1922-2013) and moved to Geldermalsen, a village at the former German-allied frontier, where he worked with the British Royal Engineers to repair destroyed bridges and railways. 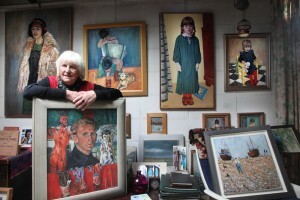 In the evenings and weekends he was painting memories of the war (ruins, burning cities, displaced persons), portraits of his wife and family, interiors and his first landscapes. 1946 and 1949 A daughter (Els) and son (Reinjan) were born. 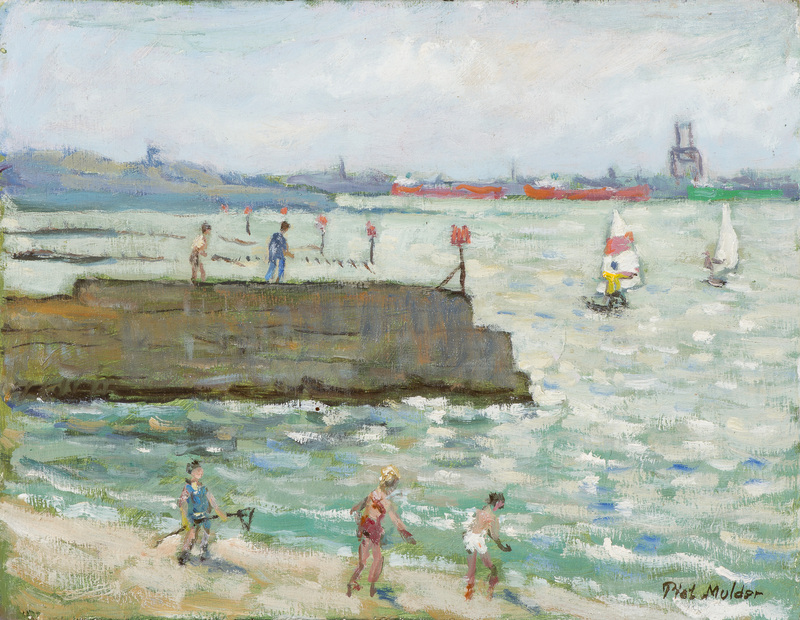 1957 Piet started with artists from Tiel, Leerdam, Gorinchem and Geldermalsen the Art Society Between the Big Rivers. Met professional artists like Marinus Boezem, Johan Ponsioen and Jan van Munster with whom he had expositions in the area. 1966 Joined the local Art Society in the nearby town of Tiel. Made many portraits and landscapes of his direct surroundings and architectural drawings for a magazine about engineering: Polytechnisch Tijdschift. Quick sketch in sketching pad. 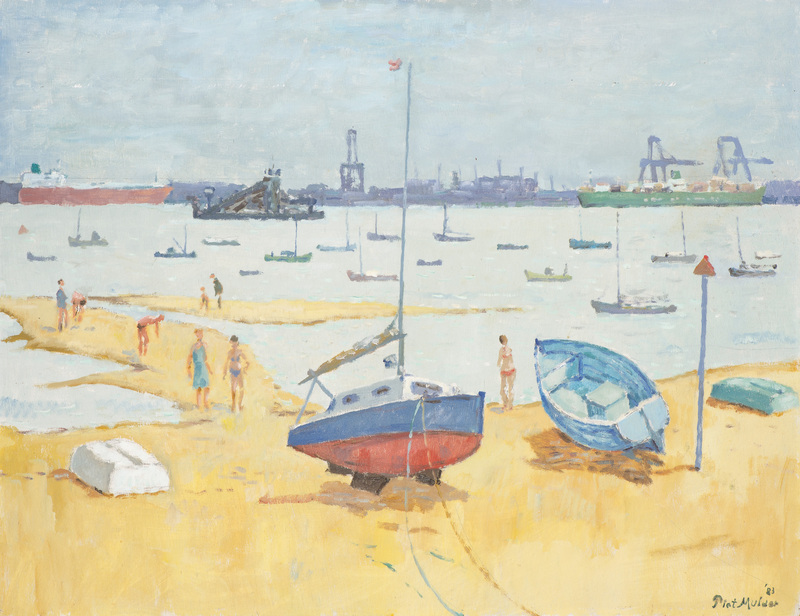 1976 Bought a studio in Dovercourt/Harwich (UK), where he went almost every month, to work on the shores of the Orwell, the Stour and to paint in the harbors of Harwich, Great Yarmouth and Hastings. Discovers British painting (Turner, Constable, Hockney, Steer). 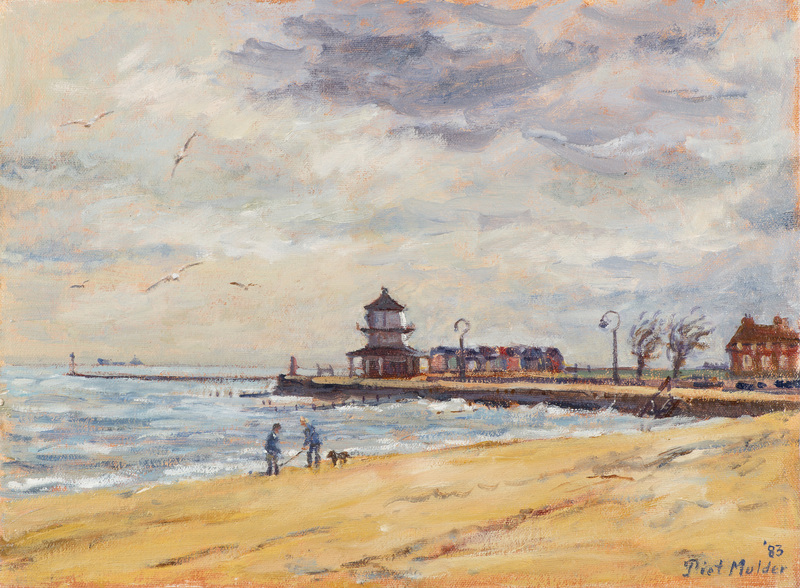 1979 Stopped working for the Dutch Railways at the age of 59 and became a full time painter, joined the Dutch Society of Marine Painters, and showed his marines in museums and galleries in Katwijk, Amsterdam, Rotterdam, Vlissingen, Bloemendaal, Enkhuizen, Middelburg, Den Helder, Sneek, Hamburg (G), Mystic (US) and many other towns. 2001 Died in Geldermalsen at the age of 81. 2013 His wife Hanna died at the age of 91 in a Tiel hospital, leaving more than 500 paintings of Piet Mulder. 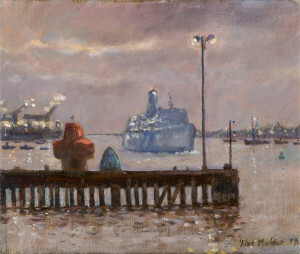 During his lifetime and after his death Piet Mulder had 40 solo exhibitions and participated in more than 60 expositions in the Netherlands and abroad together with others. His work is in several Dutch Museums and many private collections. 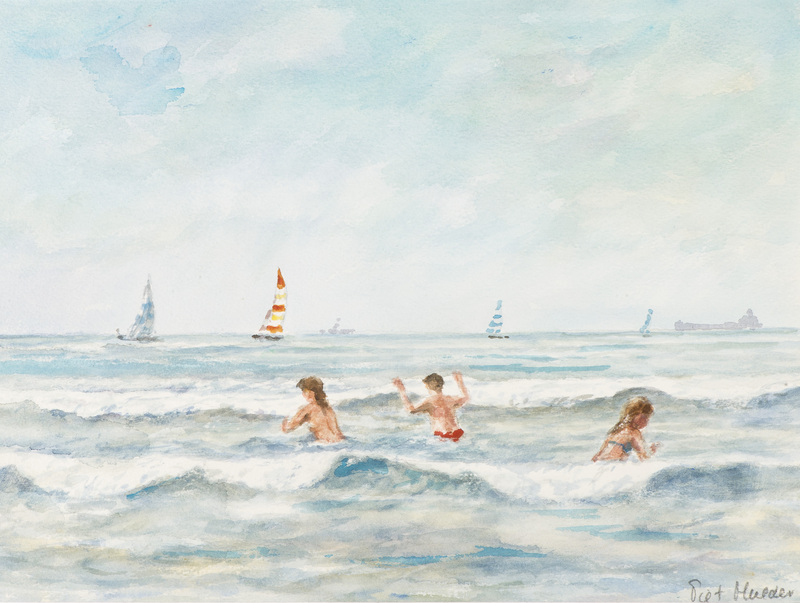 In 2014 for an exhibition of his marine paintings his son Reinjan Mulder wrote a bilingual booklet about ‘the English years’ of his father: The sea is a bore (Weideblik Publishers, Varik). Piet Mulder, Blue boat behind Dovercourt Railway Station, Oil on canvas. In may-october 2019 of Piet Mulder’s paintings there will be exhibitions in Geldermalsen, Tiel, Culemboirg, Beesd, Varik en Neerijnen. Crowdfunding for a large book on Piet Mulder is started by voordekunst in Amsterdam. The bilingual book ‘De zee is saai / The sea is a bore’ on the ‘English years’ of Piet Mulder, written by Reinjan Mulder and with more than 50 illustrations, was for sale in the High Lighthouse and a special Festival pop-up shop in Dovercourt during the Harwich Festival of the Arts in 2015 and is still available in some shops in Essex and in all Dutch bookshops. For more information and review copies please contact Reinjan Mulder by clicking on CONTACT, on top of this page.